Connect the camera to the computer via a USB cable. The USB cable you need is supplied in the camera box. Use a memory card reader. With a card reader, you simply pop the memory card out of your camera and into the card reader instead of hooking the camera to the computer. Many computers and printers now have card readers, and you also can buy standalone readers. Invest in Eye-Fi memory cards and transfer images via a wireless network. You can find out more about these special memory cards and how to set up the card to connect with your computer, at the manufacturer’s website. Your computer must be connected to a wireless network for the transfer technology to work. With the USB cable that shipped with your camera, you can connect the camera to your computer and then transfer images directly to the computer’s hard drive. You need to follow a specific set of steps when connecting the camera to your computer. Otherwise, you can damage the camera or the memory card. Windows 7, Vista with Service Pack 2, or XP with Service Pack 3 (Home or Professional edition). The program runs as a 32-bit application in 64-bit installations of Windows 7 and Windows Vista. Check the level of the camera battery. If the battery is low, charge it before continuing. Running out of battery power during the transfer process can cause problems, including lost picture data. Alternatively, if you purchased the optional AC adapter, use that to power the camera during picture transfers. Turn on the computer and give it time to finish its normal startup routine. 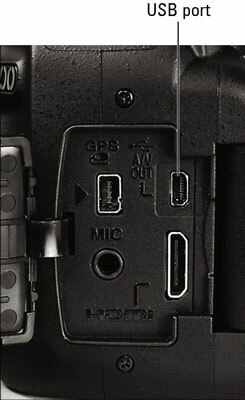 Insert the smaller of the two plugs on the USB cable into the USB port on the side of the camera. Plug the other end of the cable into the computer’s USB port. What happens now depends on your computer operating system and what photo software you have installed on that system. When the download is complete, turn off the camera and then disconnect it from the computer. Turn off the camera before severing its ties with the computer. Otherwise, you can damage the camera. After you connect the camera to the computer or insert a memory card into your card reader, your next step depends, again, on the software installed on your computer and the computer operating system. On a Windows-based computer, a Windows message box appears. The dialog box suggests different programs that you can use to download your picture files. An installed photo program automatically displays a photo-download wizard. Usually, the downloader that appears is associated with the software that you most recently installed. Nothing happens. Don’t panic; assuming that your card reader or camera is properly connected, all is probably well. Someone simply may have disabled all the automatic downloaders on your system. Just launch your photo software and then transfer your pictures using whatever command starts that process. 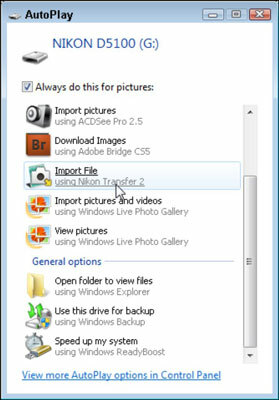 As another option, you can use Windows Explorer or the Mac Finder to drag and drop files from your memory card to your computer’s hard drive.